Our members include consumer groups (such as the Country Women’s Association of Australia), the Aboriginal and Torres Strait Islander health sector (NACCHO and the Australian Indigenous Doctor's Association), health professional organisations (representing doctors, nurses and midwives, allied health professionals, dentists, pharmacists, optometrists, paramedics, health students, chiropractors and health service managers) and service providers (such as the Royal Flying Doctor Service). This large and diverse membership gives the Alliance a comprehensive and authentic view of the health interests of rural and remote Australia. The Alliance works with a range of stakeholders to develop well-targeted, cost-effective, evidence-based solutions. It's a rich source of credible information and expertise, and works with the Government and Opposition on a range of rural health issues. The Alliance produces a range of communication materials, including factsheets, infographics, media releases, its flagship magazine Partyline - which has more than 12,000 subscribers, - and a monthly online newsletter The BushWire. Our website has more than 170,000 page views in the past twelve months. We are also active on social media with more than 9,500 Twitter followers and 4,700 Facebook followers. Our reach across rural and remote Australia allows us to quickly share information with health professionals and health consumers. We own and manage the Australian Journal of Rural Health, a peer reviewed source of research information, policy articles and reflections related to rural health. More than 216,000 article have been downloaded, with a strong international reach. It is an important publication for researchers, practitioners, and policy makers. The Alliance manages the Rural Australia Medical Undergraduate Scholarship (RAMUS) scheme for the Australian Department of Health aimed at students from a rural background. RAMUS has supported up to 587 students a semester to study medicine. Managing the program has given the NRHA unique insights into the rural health workforce. The NRHA has also managed Stream 2 of the Rural Health Continuing Education program which has supported continuing professional development (CPD) for health professionals working in remote areas. From 2010 to 2015 RHCE2 provided support to 119 projects which helped around 8,500 health professionals. We host the National Rural Health Conference, a biennial event which brings together people from across the rural and remote health sector. The conference spans four days and attracts more than 1,000 delegates. It is an important opportunity for people to network, raise issues and ideas, and to guide the Alliance in prioritising its policy work. We also present a number of other events, such as the Caring for Country Kids conference, the biennial Rural and Remote Health Scientific Symposium. 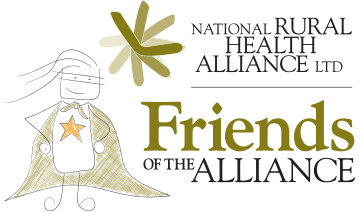 Friends of the Alliance is a network of people and organisations that support our work and provide additional grassroots connections.